A movement is under way that will fast-forward the design of new plant traits. It takes inspiration from engineering and the software industry, and is being underpinned in Cambridge and Norwich by an initiative called OpenPlant. Humans have been modifying plants for millennia, domesticating wild species and creating a bewildering array of crops. Modern agriculture allows global cultivation of plants at extremely low cost, with production on the gigatonne scale of a wide range of biostuffs – from fibres, wood, oils and sugar, to fine chemicals, drugs and food. But, in the 21st century, we face both ever-increasing demand and the need to shift towards more sustainable production systems. Can we build new plants that make better materials, act as miniature ‘factories’ for food and fuel, and minimise the human impact on the environment? With this in mind, synthetic biologists are beginning to build new organisms – or at least reprogramme existing organisms – by turning the biology lab into an engineering foundry. Synthetic biologists choose a ‘chassis’ and then bolt on standard parts – such as genes, the promoters that activate them and the systems they drive – to build something that’s tailor-made. And, like open-source software programmers, they have been looking to open-access and the sharing of code – in this case the DNA that codes for each part – as a practical means of speeding up innovation. “Providing free access to an inventory of molecular parts for use in the construction of diverse plant-based systems promotes their creative use by others, just as the open-source feature has driven innovation in the computer software industry,” explained Professor Sir David Baulcombe from Cambridge’s Department of Plant Sciences. Earlier this year, the University of Cambridge and the John Innes Centre in Norwich received £12 million in funding for a new UK synthetic biology centre – OpenPlant – to focus on the development of open technologies in plant synthetic biology and their application in engineering new crop traits. The effort is being led by Baulcombe and Dr Jim Haseloff in Cambridge, and by Professors Dale Sanders and Anne Osbourn in Norwich. It’s one of three new UK centres for synthetic biology that, over the next five years, will receive more than £40 million in funding from the Biotechnology and Biological Sciences Research Council and the Engineering and Physical Sciences Research Council. OpenPlant aims to establish the first UK open-source DNA registry for sharing specific plant parts. It will also support fundamental science: “Construction of these parts will allow us to test our understanding of natural plant systems in which assemblages of parts create a greater whole,” Baulcombe explained. Researchers like Baulcombe and Haseloff, who also leads a new Strategic Research Initiative to advance cross-disciplinary research in synthetic biology in Cambridge, believe that the investment in the three new centres will help the UK stay at the leading edge of plant synthetic biology. “Any large-scale reprogramming of living systems requires access to a large number of components and, as the number of these parts balloons, the cost of building a portfolio of patents, or licensing parts from patent owners, could strangle the industry and restrict innovation,” explained Haseloff. As well as new DNA components, Haseloff and colleagues have been focusing on a new plant chassis. Rather like the frame of a car, the chassis is the body of the cell that houses the rest of the desired parts. And for this they have turned to liverworts, relics of the first land plants to evolve around 500 million years ago. 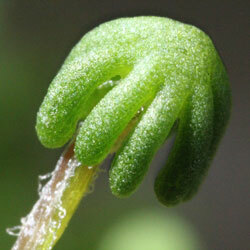 The Marchantia polymorpha liverwort is small, grows rapidly, has a simple genetic architecture and is proving such a useful test-bed for developing new DNA circuits that Haseloff has launched a web-based resource (www.marchantia.org) for a growing international community to exchange ideas. The hub characterises one of the wider aims of OpenPlant in promoting interdisciplinary exchange between fundamental and applied sciences, and is one of a series of collaborative projects, such as OpenLabTools (see panel), which are promoting open technology, innovation and exchange between engineers and physical, biological and social scientists across the University. In parallel with the development of standardised parts, the Centre will support around 20 researchers and their teams in Cambridge and Norwich who are engineering new plant traits. For instance, scientists at the John Innes Centre are investigating new systems for producing useful compounds like vaccines. In Cambridge, researchers are creating systems with altered photosynthetic capabilities and leaf structure to boost conversion of the sun’s energy into food, as well as developing plant-based photovoltaics for fuel. “We think that biological technologies are the underpinning of the 21st-century’s industrial processes,” added Haseloff. “Plants are cheap and inherently sustainable, and have a major role to play in our future. Inset images: Marchantia - a primitive plant form used as the 'chassis' for designing new plants. Credit: Jim Haseloff. OpenPlant is part of a wider move towards ‘sharing’ in Cambridge that now includes scientific tools of the trade. Resourcing laboratories with scientific tools is a costly business. An automated microscope, for instance, could cost upwards of £75,000, and yet be a key tool in materials and biological laboratories. Now, an initiative coordinated by Dr Alexandre Kabla, from the Department of Engineering, is rethinking how scientists can access the tools that they need at a less-prohibitive cost. He recognised that a wealth of instrument-building know-how exists across the University – expertise that could be drawn on to develop a suite of low-cost open-access scientific tools. Raspberry Pi, for example, was conceived and incubated in the Computer Laboratory to encourage children to learn programming for themselves: this credit-card-sized computer is now available for only $25. The OpenLabTools initiative has set itself the task of creating high-end tools such as microscopes, 3D printers, rigs for automation and sensors, with an emphasis on undergraduate and graduate teaching and research. It was created with funding from the University and the Raspberry Pi Foundation, and is supported by an academic team of engineers, physicists, materials scientists, plant biologists and computer scientists. To encourage open access, ‘How To’ manuals and designs are being published on the OpenLabTools website.